Westchester County Executive Rob Astorino will be running for a 3rd term this November. He’s being coy about taking a second shot at Governor Cuomo next year. The Journal News reports that Yonkers Mayor Mike Spano won’t be challenging him. As a general rule, Westchester residents should not vote for any candidate with the last name Spano. Two state legislators are reportedly considering seeking the Democrat nomination as well. Senator George Latimer. Supported the SAFE Act. Voting record shows he does not support gun rights. Assemblyman Tom Abinanti. Sponsors and votes for antigun legislation. During debates on the SAFE Act he said (paraphrased) that he didn’t believe guns should be able to hold more than one round. With the possibility of the Suffolk Co. Sheriff’s seat opening this fall, two state legislators have come forth in hopes of getting the GOP nomination. First is Assemblyman Al Graf who has a law enforcement background and appears to have support from the county party. He is an NRA member and a supportive record in the Assembly. Next is Senator Phil Boyle who has no police background and has the backing of the county Conservative Party. His record on guns is awful and he is shamelessly dishonest about it. He has switched sides on the issue at least three times. He voted for the SAFE Act then sponsored a bill to repeal it. What he is claiming to be now I don’t know. Incumbent Democrat Vincent DeMarco has announced his intention to run for re-election, although his name has been mentioned as a possible Trump appointment. DeMarco signed onto the New York State Sheriffs’ Association amicus brief calling for the courts to overturn the SAFE Act. With no clear way of getting rid of Boyle, the next best thing would be to make him look stupid by voting against him in a R or C primary. If he gets past that, vote for DeMarco or whomever his Democrat opponent is in the general. 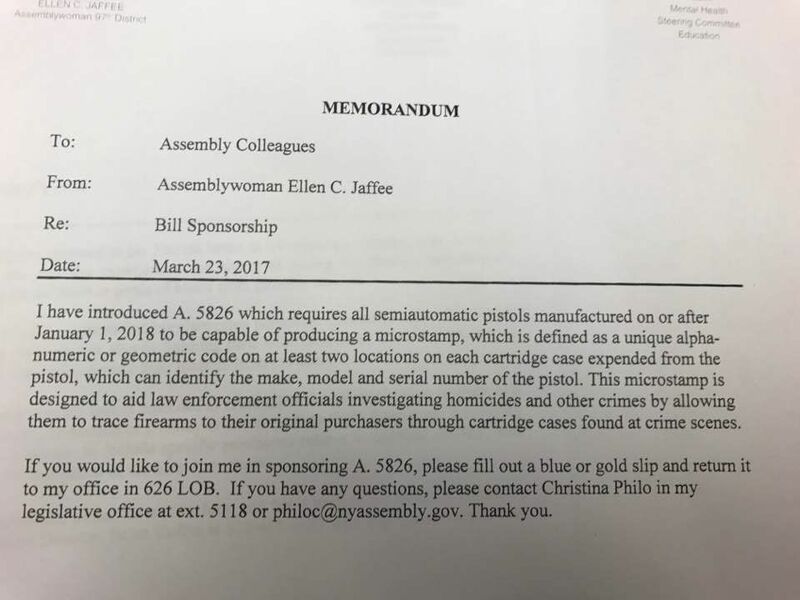 Assemblywoman Ellen Jaffee has reintroduced the microstamping bill A-5826. NRA is running ads in four states in an attempt to pressure Democrat Senators to vote for Neil Gorsuch. That’s good. In addition, Senator Joe Manchin (D-WV) has indicated he will vote for cloture on the nomination. This is probably just hot air from Manchin, but I would not put it past the Republicans to offer him something in exchange for his Gorsuch vote. This was a really dumb move on his part. It was a rookie mistake he can recover from. The problem for 2A is that it comes at a bad time. Democrats want to block Neil Gorsuch’s nomination and this gaff will embolden them. To get past the threat of a filibuster, Trump, Mitch McConnell and the Senate Republicans need to step down hard on Chuck Schumer. There can be no comprise here. Any weakness on the part of Trump or McConnell and Schumer wins. The next redistricting takes place in 2020 and goes into effect in 2022. Assuming they don’t collapse beforehand, this will be the end of the Senate Republicans. This year’s antigun lobby day has been set for May 17 at the LOB/CAP. It is an annual event where gun control advocates bus in some children from the City, meet with sympathetic legislators and put on a dog-and-pony show in The Well. I believe their top agenda item will be the mandatory storage bill, A-457. New Yorkers Against Gun Violence is usually the host, but this year it appears that Moms Demand Action has taken over. Here is a link to their Facebook event. Senate confirmation hearings on SCOTUS nominee Neil Gorsuch began yesterday. It’s a safe bet both Heller and McDonald will come up during questioning. The Judiciary Committee is set to vote on the nomination April 3 and the full Senate sometime after that. Ultimately I expect Gorsuch will be confirmed. There isn’t much of a well organized opposition to him, mostly people already angry that Trump won. Chuck Schumer is not doing a very good job at being Minority Leader. I was expecting him to be a much bigger pain than he has been so far. Video from NYC Moms Demand Action Meet-Up.